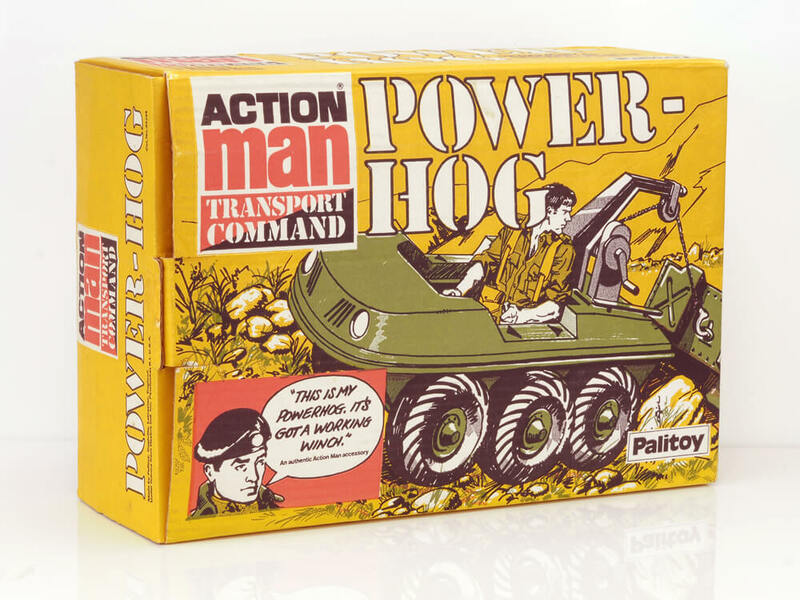 "The Power-Hog rolls on land and floats in the water". 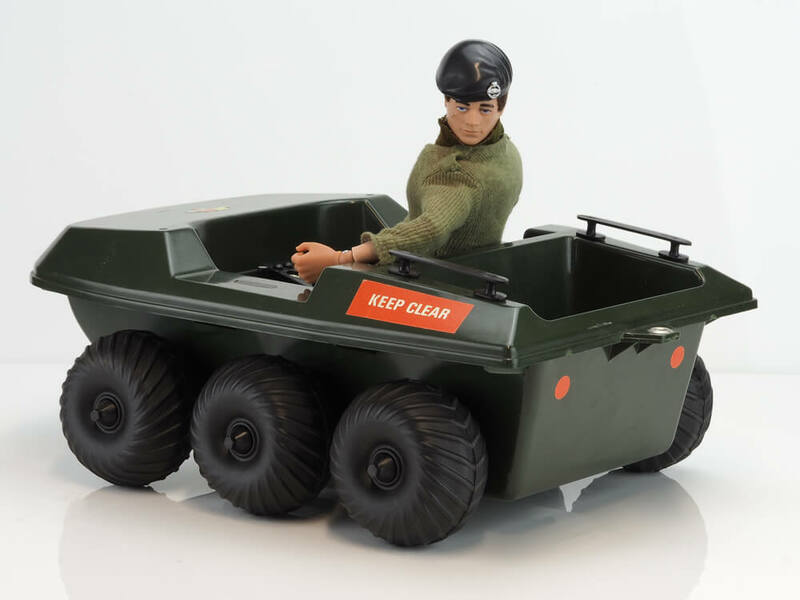 This Hasbro	designed	recovery and service vehicle for Action Man has three axles and takes one Action Man as driver. 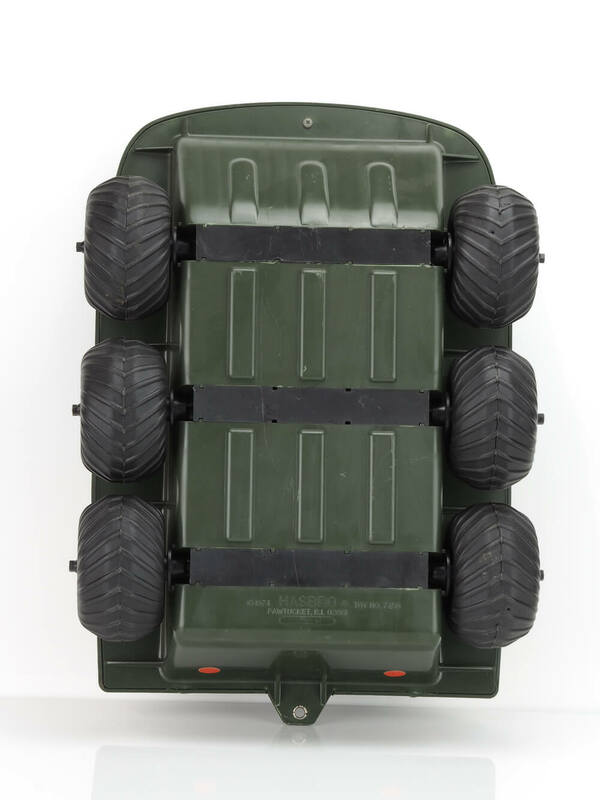 The replaceable winch at the back could be inserted into four keyholes, vacated by two hand grips removed from the rear cargo section. 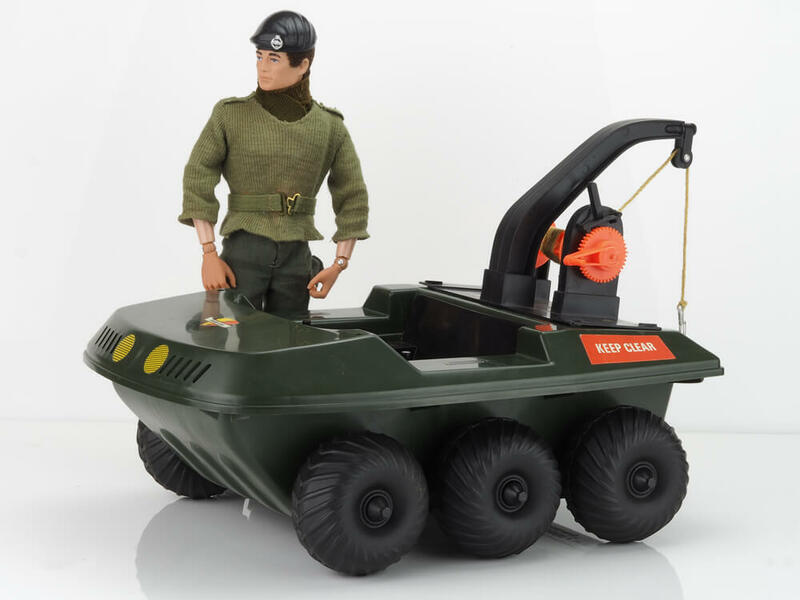 The working winch even had a pawl, rope and hook for special missions. 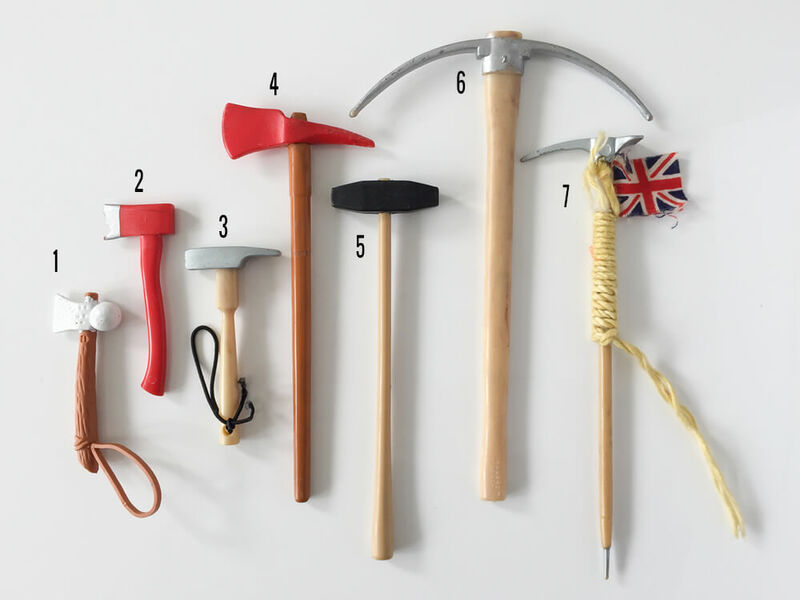 It came equipped with a Spade and Pick Axe, which also featured elsewhere on equipment cards. 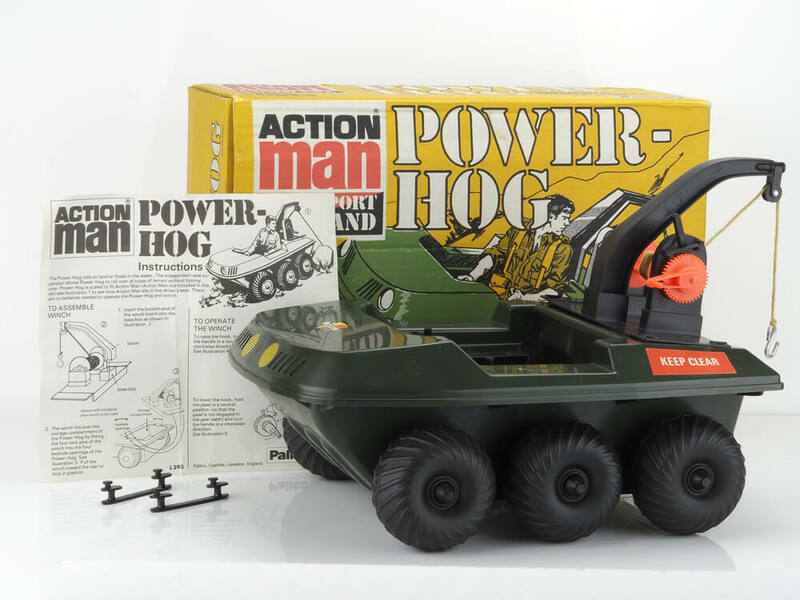 As the Action Man Power-Hog is in the Equipment Manual of 1977 and 1978 only, it would suggest it was no longer in production by 1979. 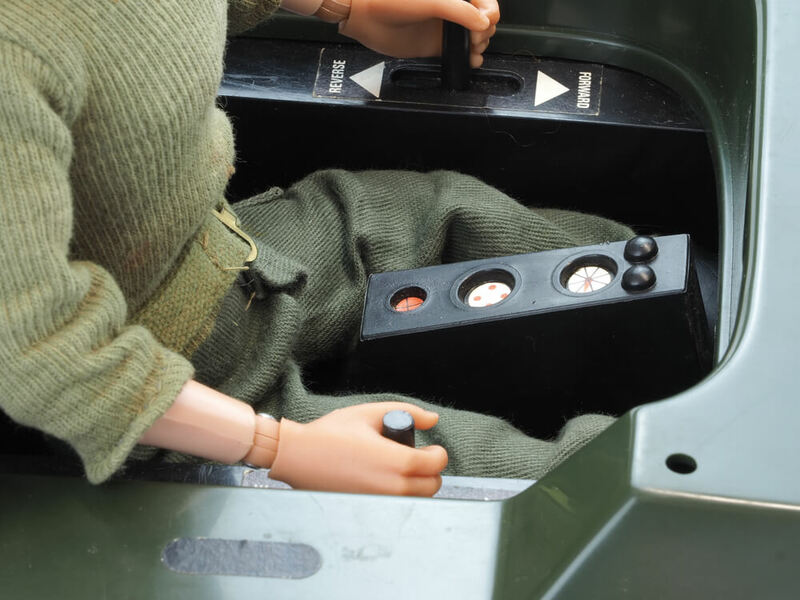 This vehicle was launched at the start of the Eagle Eyes period of figures. 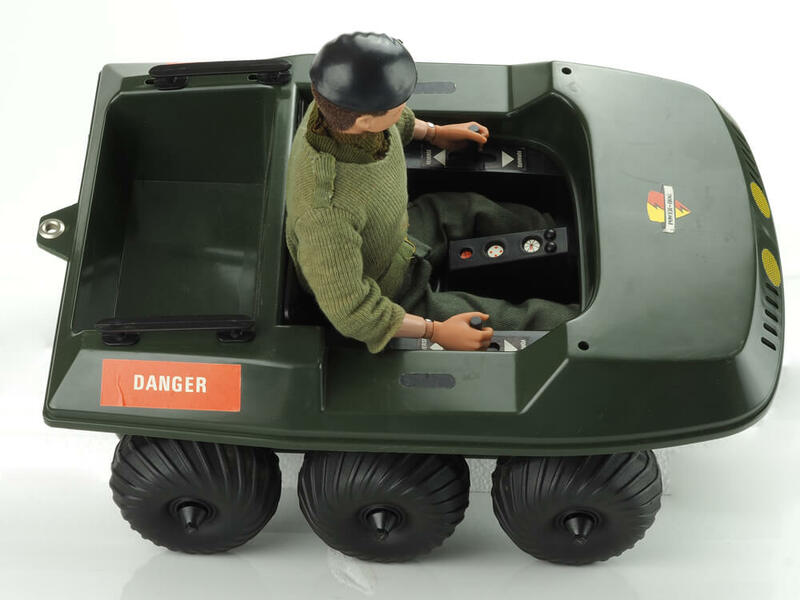 This Hasbro-designed vehicle is common and is fairly robust too - not too many are broken beyond practical use. 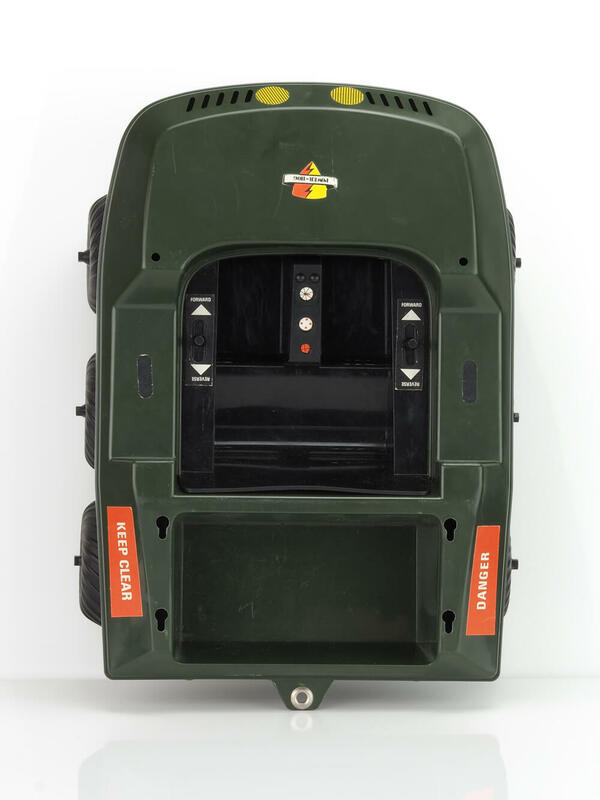 The headlight stickers are placed close together (as per vehicle shown), rather than spaced to either side. 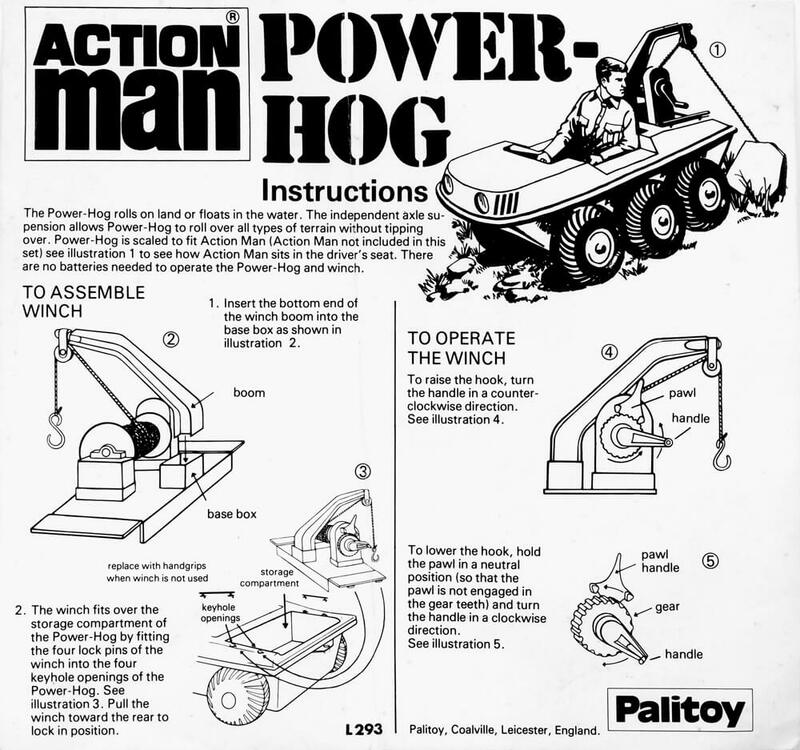 The Official Manuals confirm this set up. 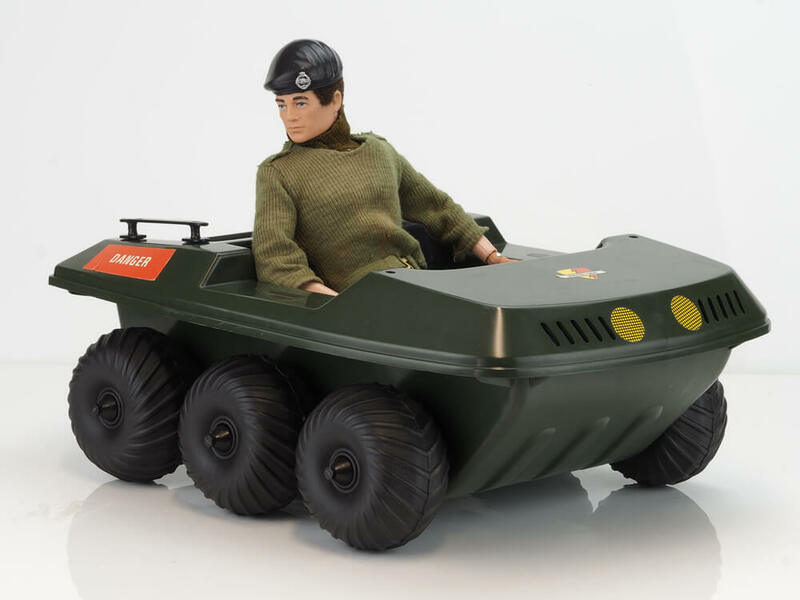 Is it of US Hasbro origins and similar vehicles were spored including the 'Snow Cat' with white / green arctic camouflage and tracks and the 'Space Ranger Planetary Patrol Vehicle' in black livery. 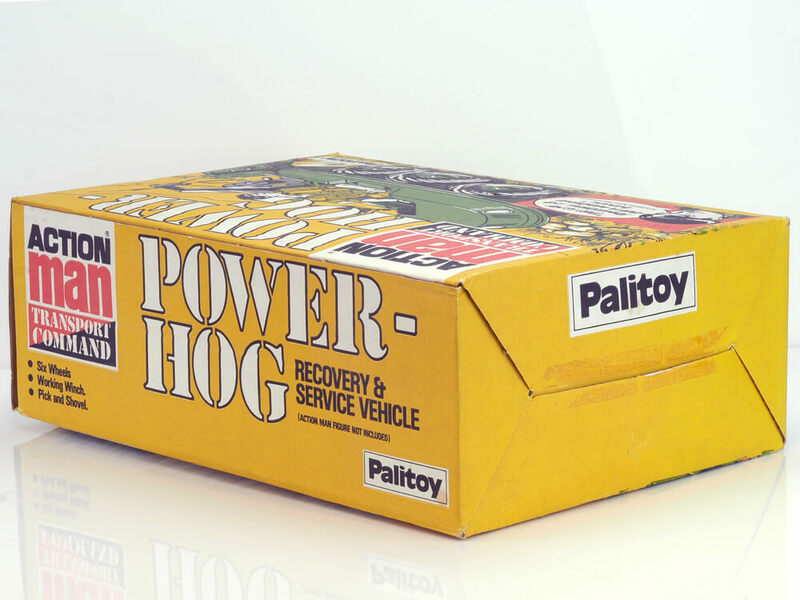 The Power Hog Box (which contained no less than 8 stars!) 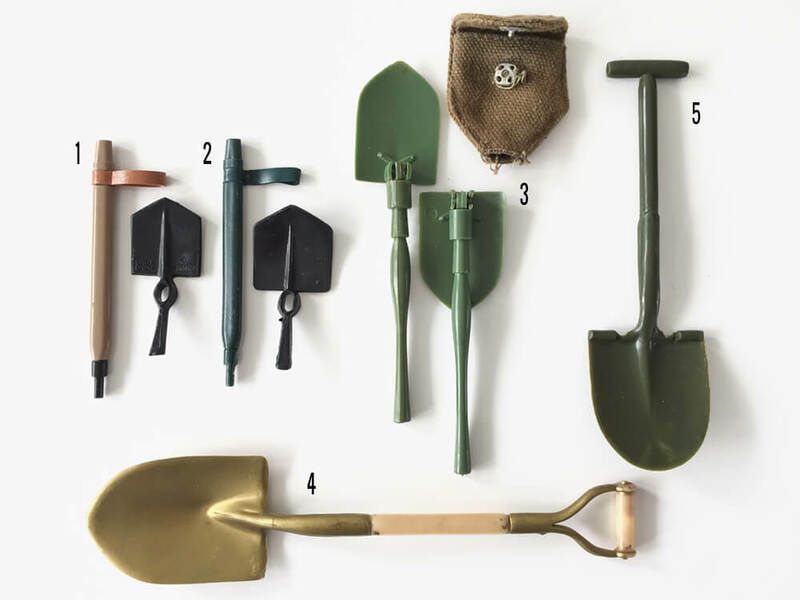 was produced in a light khaki colour as well as yellow as shown. 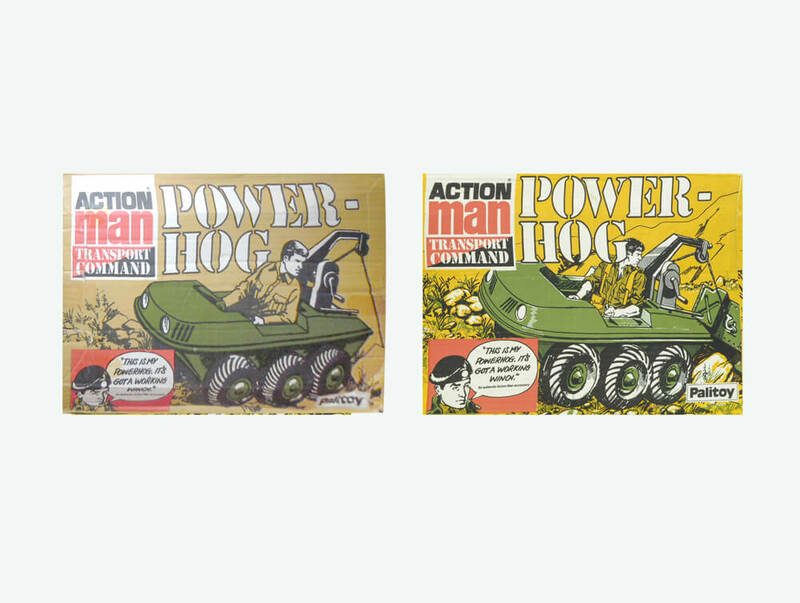 Action Man Power-Hog boxes - 1st issue Khaki (1977-8? 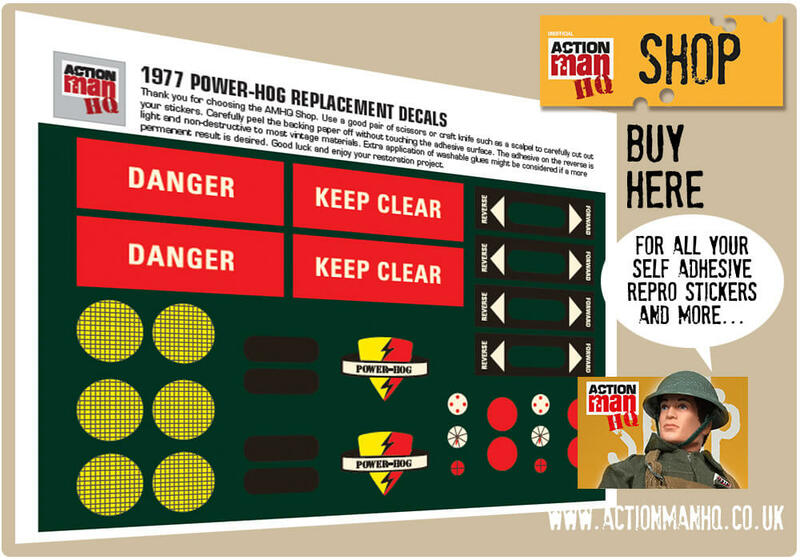 ), 2nd Issue Yellow (1978-9? 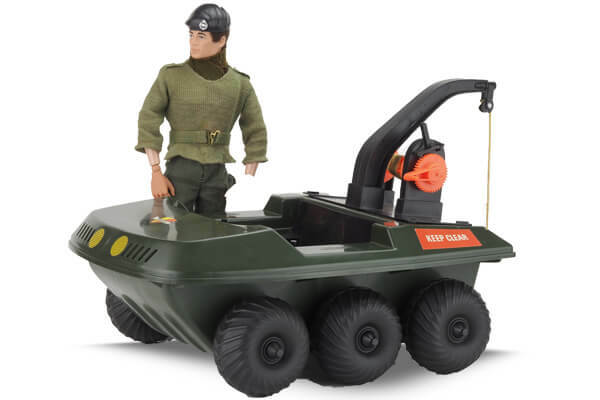 ): Note the illustration is revised to show the winch and hook pulling up a vehicle (Jeep?) 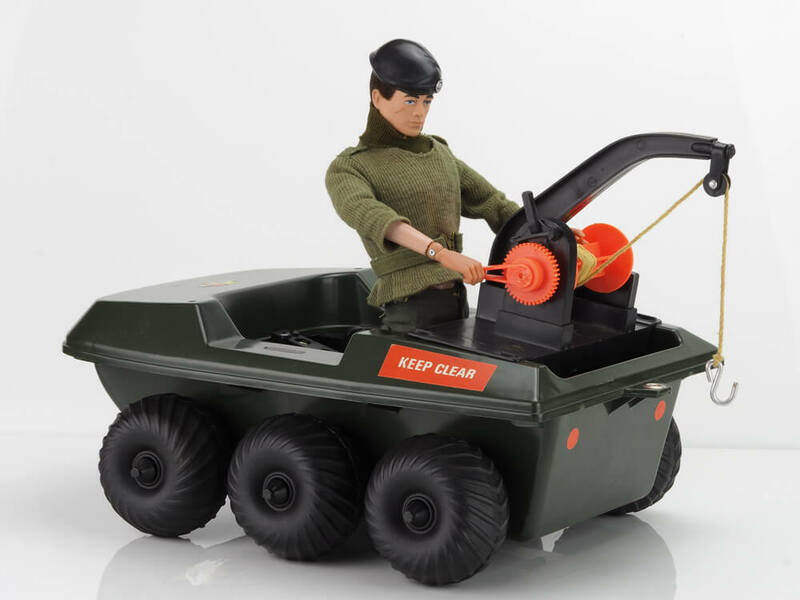 in the second issue box. 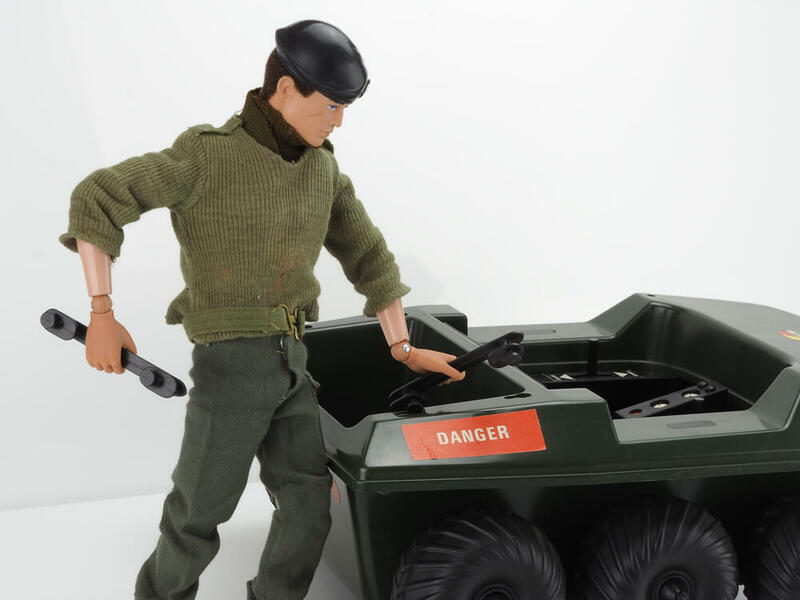 One would assume a trick was missed by not showing what the vehicle was purposed to do in the first case.